I almost forgot to make a card for a wedding that we will be attending soon. Amazingly, I got it right on the first try, mostly due to my husband's K.I.S.S (Keep It Simple Sweetheart) advice. 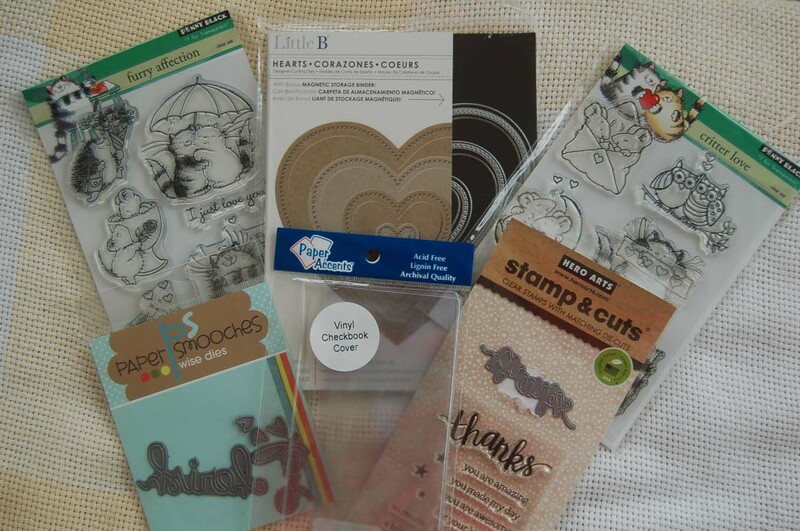 HM Ben Franklin Crafts has lots of 12x12 washi sheets to choose from, but if you have lots of scraps (like me) you can work with those. 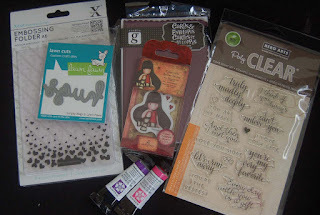 The Sizzix square die set makes it easy to cut out the washi paper squares with out measuring. 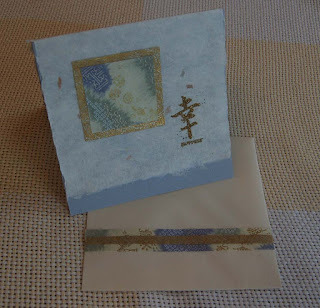 To cut the fibrous white cover paper and leave a deckle edge, I placed a ruler down and moistened the edge area before pulling the paper upward. 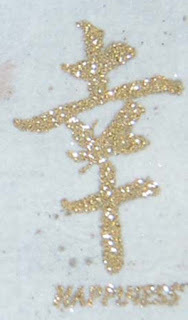 My card photo doesn't show the sparkle of the embossing powder (gold enchantment NUVO) used on the stamped (Mari and Me) happiness character, but it does compliment the gold fibers in the washi papers. 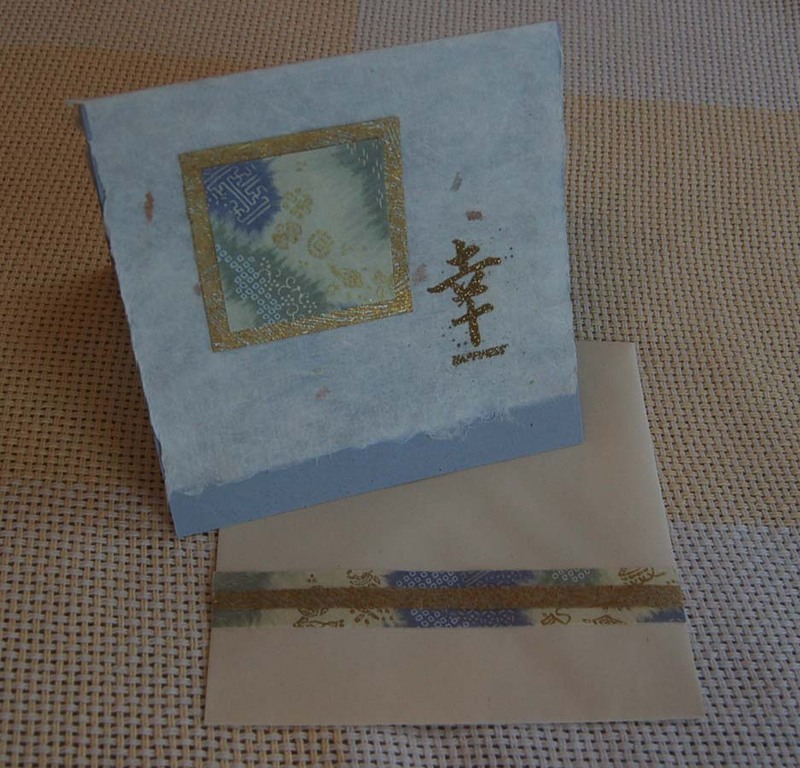 I decided to add some washi paper scraps to the envelope so it would coordinate with the card. 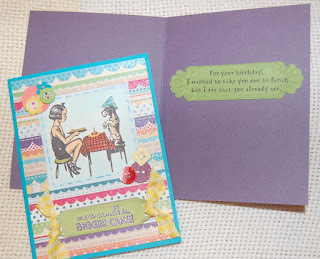 Hopefully, this post will encourage you to whip up a card even though you may think you don't have enough time,,,you do! Here is a close up view of the heat embossed 'happiness' character....pretty yeah? 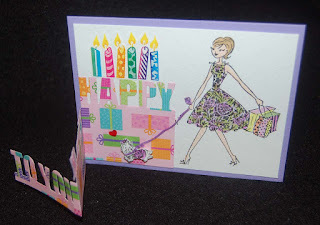 I know lots of over the hill folks for whom this card would be suitable (including loopy old me...LOL!). 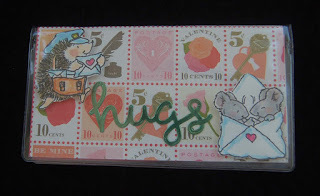 I really like the vintage image and inside sentiment from Viva Las Vegas Stamps. 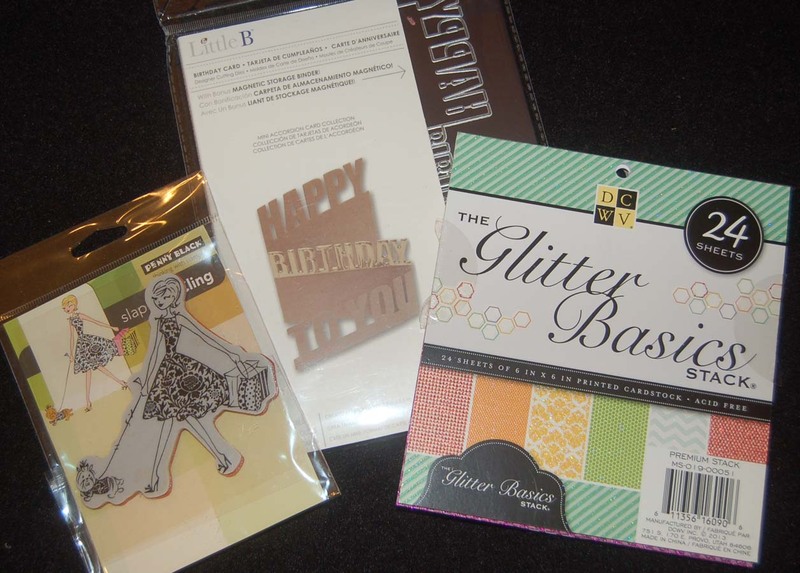 I paired them with a DCWV glitter birthday card stock, buttons (real and paper) and a ribboned die cut (Spellbinders) paper label. Unfortunately the shimmer of the paper, embossed words and buttons made getting a good photo nearly impossible. Here is another color version of the same card. I was planning to border the image with buttons but that was too visually heavy so I opted for a few and drew in some stitches instead. The new button Xcut die was purchased from HM Ben Franklin Crafts and makes it fun to add lots of buttons without the weight. I had some cute real buttons that added some texture and interest. I wonder if the recipients of these cards will get the humor of being 'out to lunch'? These days everyone seems to be and some even take their dogs with them.....hahahaha! 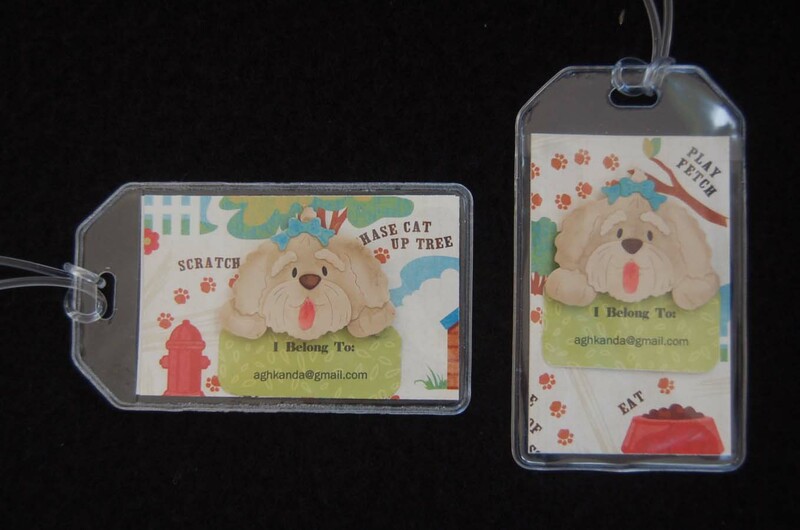 These Shih Tsu luggage tags were made for an owner and lover of this breed. 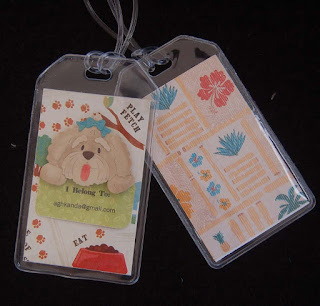 In an effort to use up some of the paper scraps piling up on my desk, I decided to make the dog tags in two directions to match the design of the DCWV 8X8 paper from the Pet Stack. 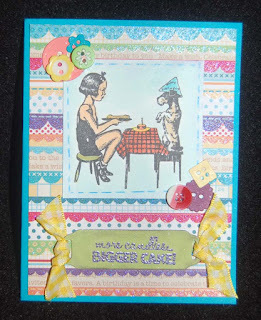 The dog was die cut (Cottage Cutz) from a scrap of beige card stock and highlighted with brown chalk. The tongue, nose and bow were colored in with Copic pens before gluing the dog together. The black of the eyes was achieved by gluing a scrap of black paper behind the die cut eye holes. Since the recipient of these tags is going to travel to Hawaii, I put a piece of tropical paper in the back of the dog luggage tags. For the sign the dog is holding I used my computer to print the words....choose the font and size then print it on computer paper and run it through again with the paper sign covering the words (use removable washi tape to hold it in place)....voila, the words are printed on the sign! The Paper Accents vinyl tags come three to a pack and are sold at HM Ben Franklin Crafts. 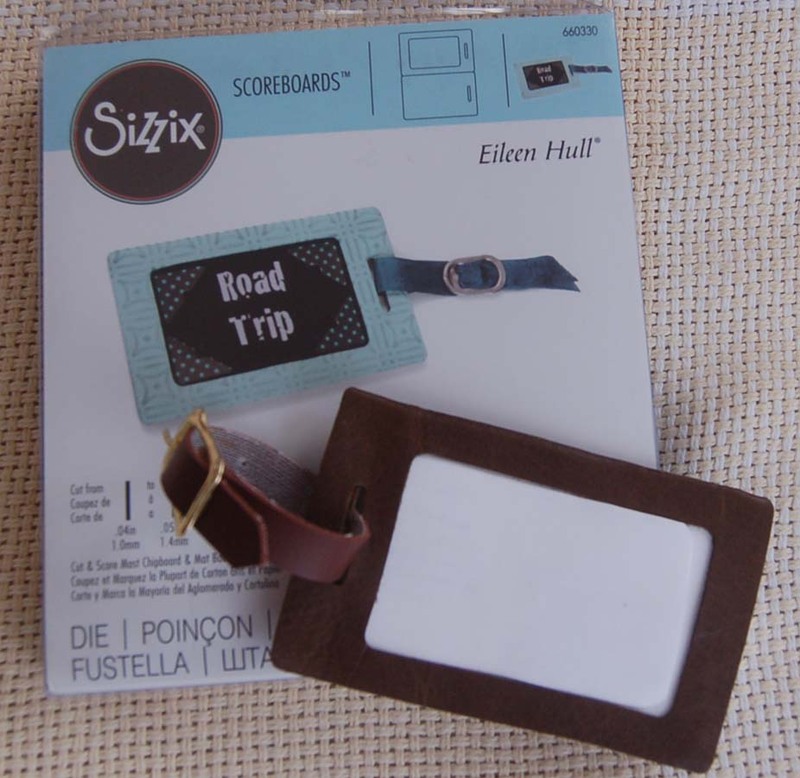 I also made a leather luggage tag for my husband using the Sizzix scoreboard luggage tag die (from BFC). 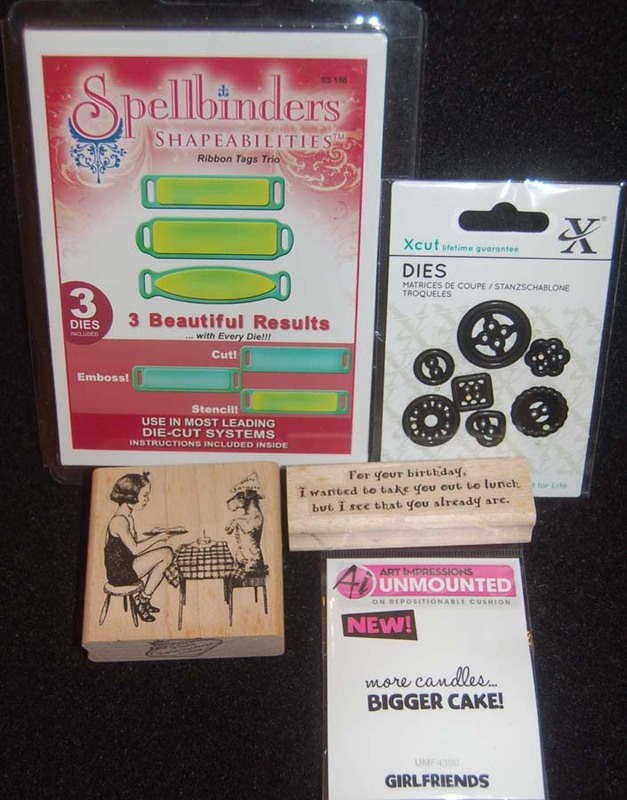 I discovered that thin leather cuts easily with this die and the tag accommodates a business card. To finish the leather tag, the sides were glued together after a laminated business card (covered up in the photo) was inserted. Finally, a leather strap with a buckle was added. My husband was really thrilled by this luggage tag and someday if I get a power sewing machine, I will sew the edges instead of gluing. 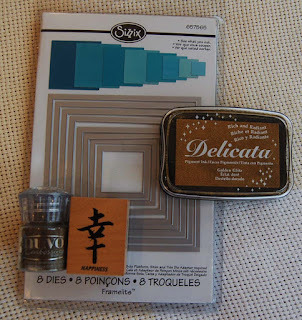 Hopefully, this post has given you some crafty ideas. Please stop by again to see more of my creations. 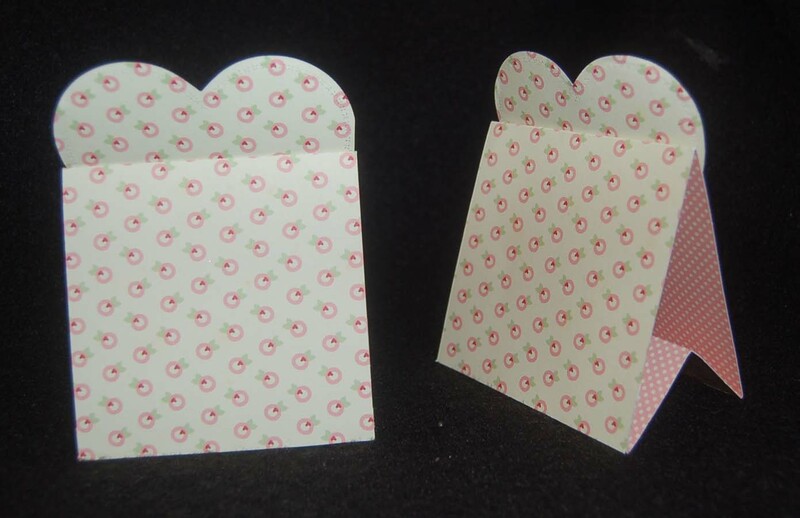 Here is another version of the Post It Notepad Holder that I showed you in the last post. 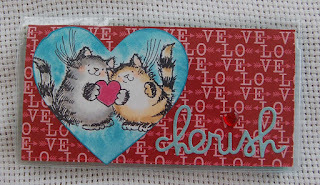 Made from a clear vinyl checkbook cover (Paper Accents) this one is a small Valentine card/gift. I stamped and colored some Penny Black images, fussy cut them out and adhered then with foam sticky dots. I was happy to find a stamp design Valentine paper in my stash. 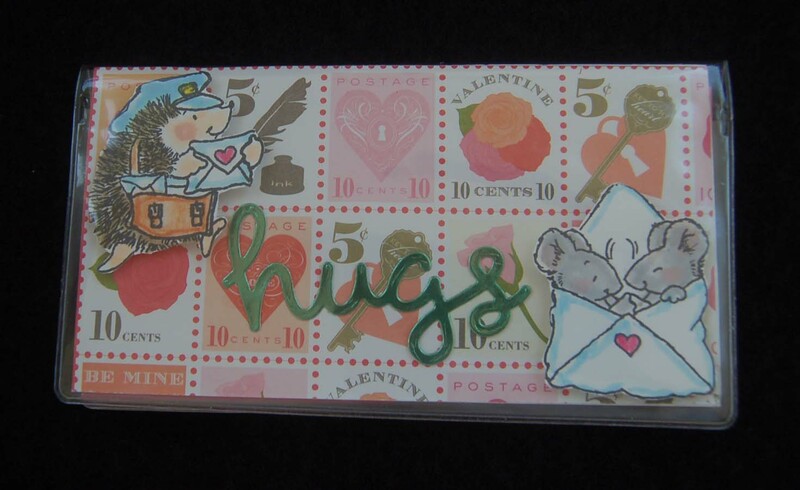 A 'HUGS' was cut from foil paper with a Lawn Fawn die. 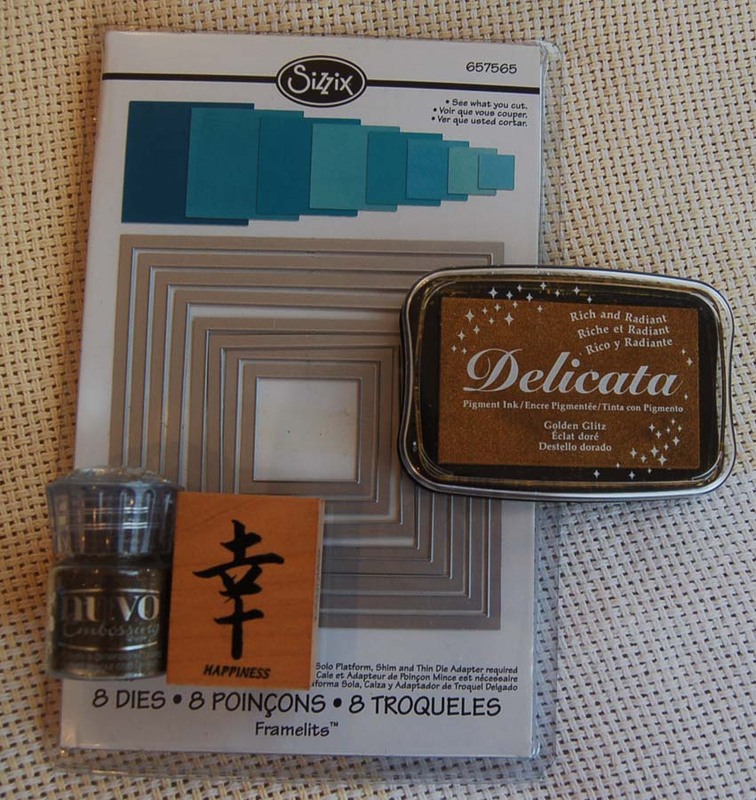 To glue on the delicate die cut word, I used Crystal Accents (Ranger) which is really not a glue but works well to adhere small pieces because it dries quickly and is clear. Here is what the inside looks like. The heart tree was cut from green foil paper (DCWV) with a Taylored Expressions die. The little banner came from a Pebbles packet of cute die cuts with sweet sayings. On the last post I forgot to mention that I slipped a photo (from the dinner) in the back of checkbook cover. I think this really personalizes the holder and makes it a good keepsake. Hope you had a sweet Valentine's Day. 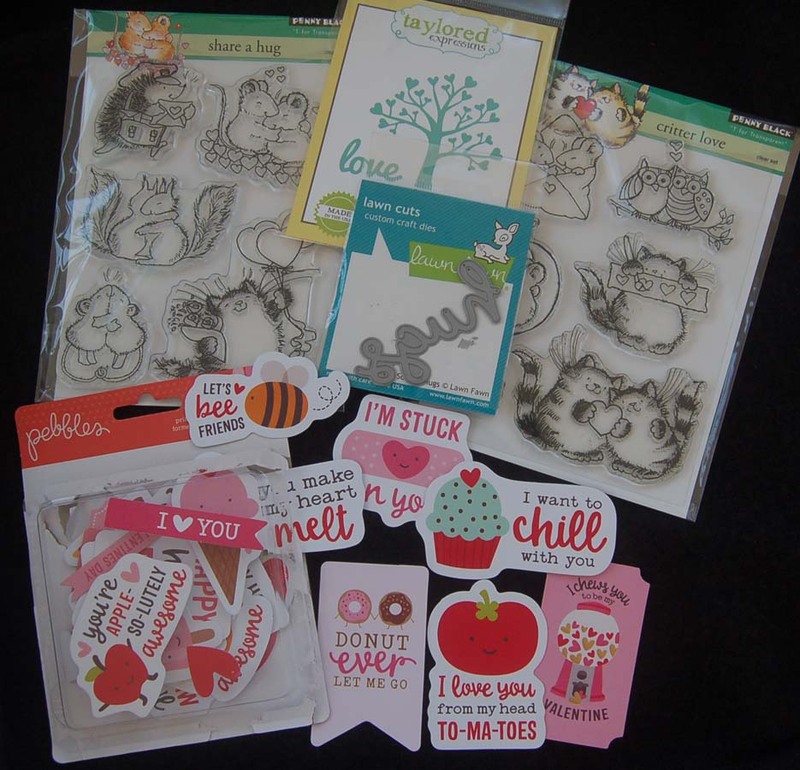 This year was super busy so I didn't get to use all the supplies I purchased for Valentine's...oh well, I'll pack them up for next year. LOL! 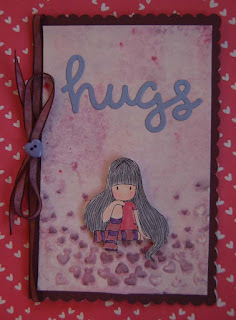 I promise to start creating my Valentine inspired pieces earlier....really! 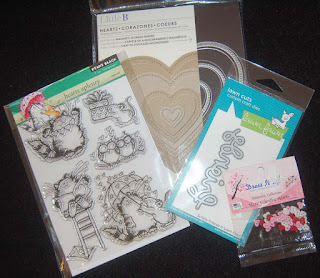 Recently, I purchased a few clear vinyl checkbook covers from Market City HM Ben Franklin Crafts. 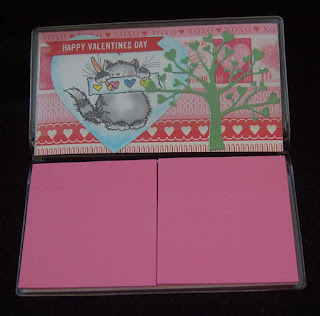 I was planning to make a Valentine checkbook cover for my son who treated us to an elegant Italian dinner in Waikiki. However, I decided that few people use checks anymore. Since he surely uses Post It notes, I re-purposed the checkbook cover to hold Post It notepads. With Penny Black stamps and double sided Valentine card stock it was easy to cut the paper to fit the holder, stamp and color a die cut (Little B) heart and add a die cut 'cherish'(Paper Smooches). The red acrylic heart that I glued over the "i" doesn't show up well in the photo so perhaps I should have used a different color. Here is what the inside of the Post It holder looks like. 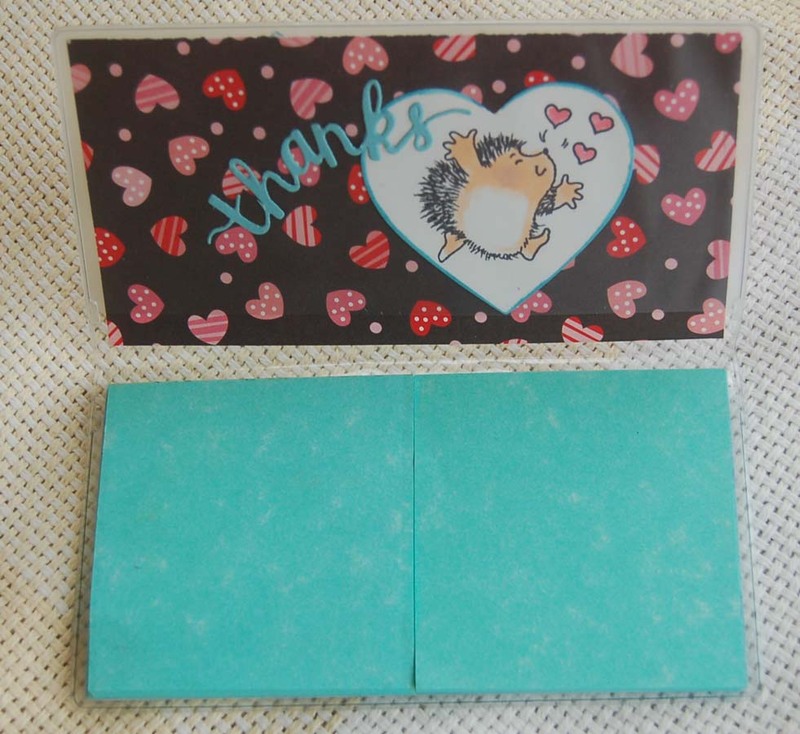 I thought it would be nice to have a die cut 'thanks' (Hero Arts) on the inside and to write a thank you message on the first page of one of the note pads. I am quite proud of how I found a new use for the clear checkbook covers. Please visit this blog again to see another version of the same project. Hope you have a L-O-V-E-ly Valentine's Day! This card is for a loving owner of a sweet Shih Tsu. The Penny Black image was the starting point and it was stamped on a rectangle of watercolor paper. Copic pens were used to color the image. 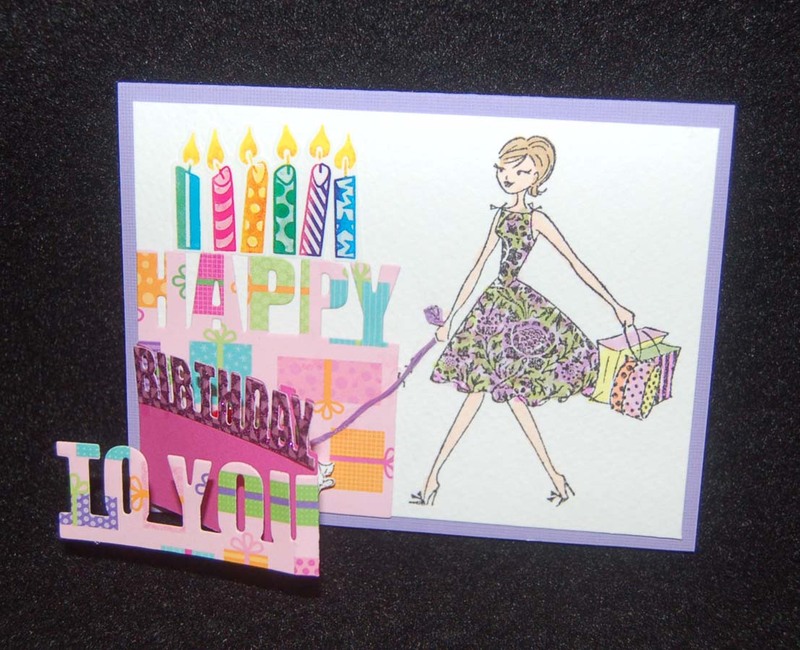 A Little B die (from HM Ben Franklin Crafts) was used to cut out a fold out piece from a 12x12 DCWV sheet (from the birthday pad). The word ' BIRTHDAY ' (die comes with the Little B set) was cut out from a printed glitter 6x6 DCWV sheet. When the card is folded open the cut out Shih Tsu on pop dots is revealed. I added a purple twine 'leash', epoxy heart, and Mrs. Grossman candle stickers for texture and interest. I like that the dog is a hidden surprise. I hope that your life is full of crafty surprises....keep looking and creating them! 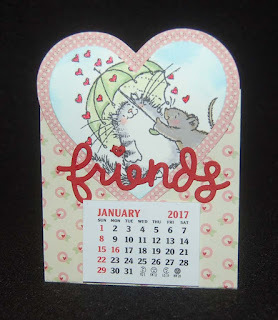 I had two more Vippies calendars left so I decided to make a couple of friendship calendars to mail to some friends (along with a belated family newsletter). 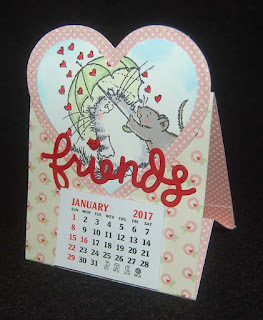 Since I had my Valentine card stock out, I chose a pretty double-sided printed piece and cut it into three 4" wide strips. Two of the strips were folded into easels with 4" square fronts and backs. 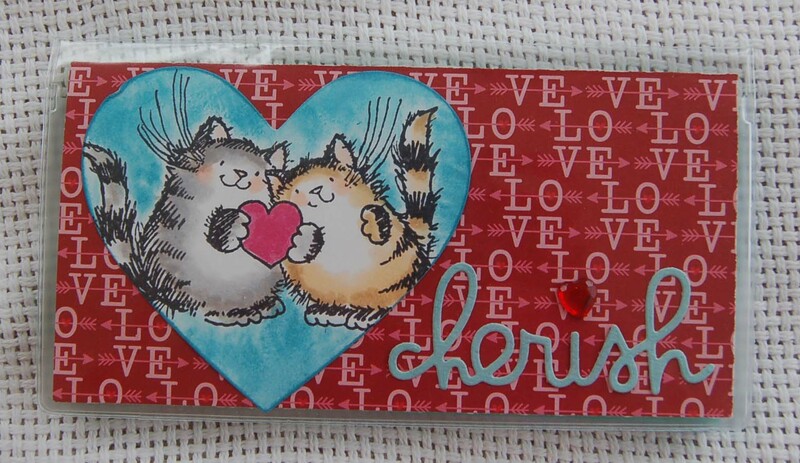 A Little B die and matching border heart-shaped cross stitch design were chosen to make the larger heart and the inner white heart was cut from watercolor paper using a smaller heart die. 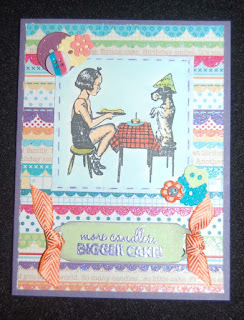 Next I stamped the Penny Black image and colored it in with various marking pens. 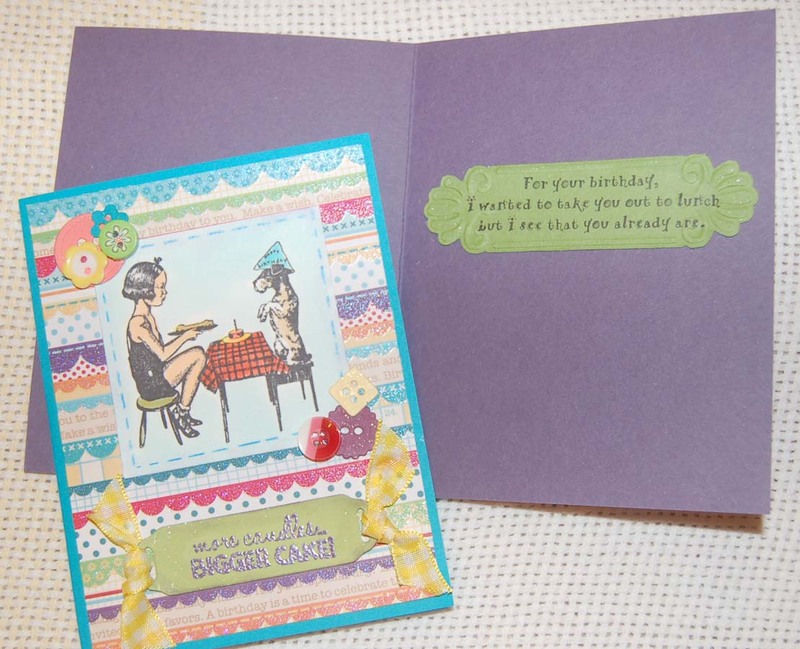 The Lawn Fawn 'friends' die cut was adhered with Glossy Accents and embellished with a Dress It Up mini heart button. The hearts raining down were colored in with a sparkle gel pen. 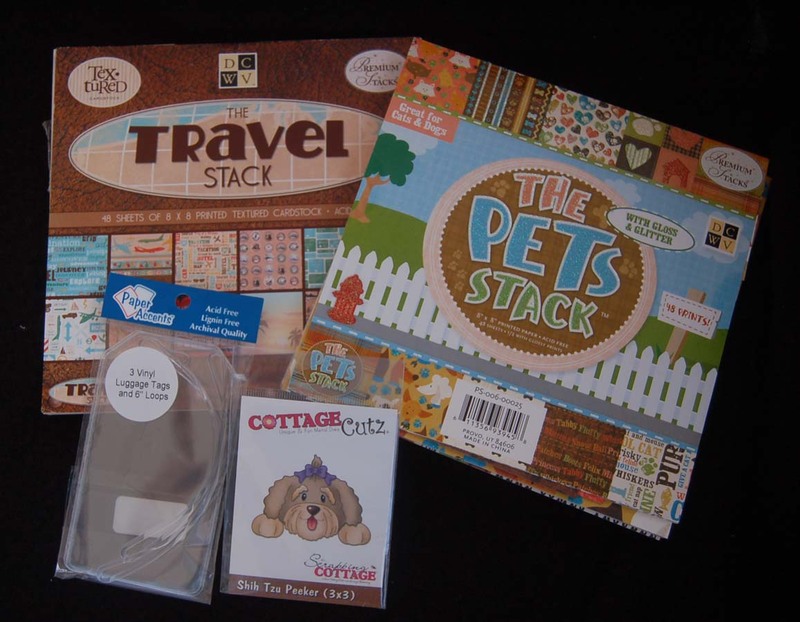 The Vippies calendars come with adhesive strips so they stick easily to the card stock easels. Because double sided card stock was used, the calendars look attractive even from the back or side. 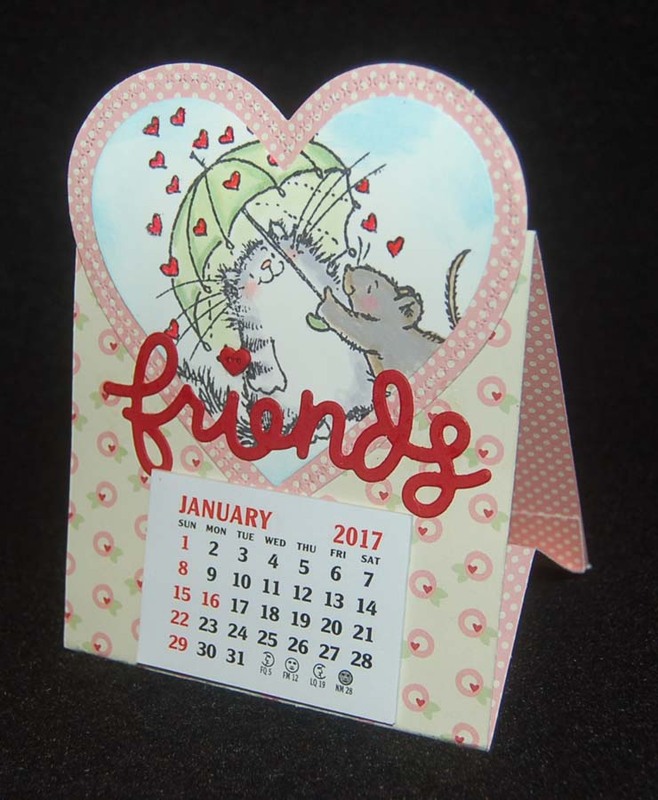 I tried to make the calendars look a little Valentinish for the season but tried not to overdo the hearts because the calendars will be used all year round. 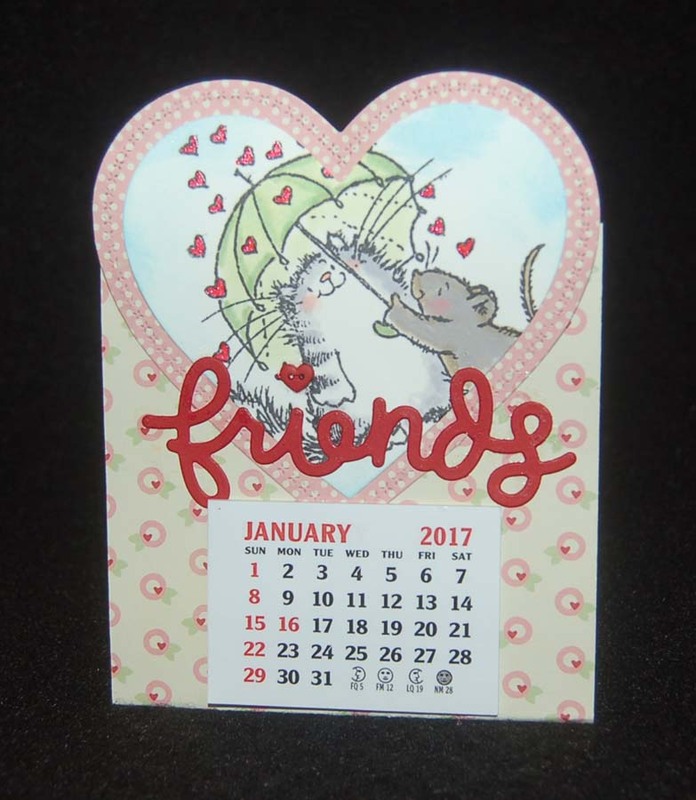 The 4" wide easel works well with the medium Vippies calendar, but can be easily re-sized for other calendars. 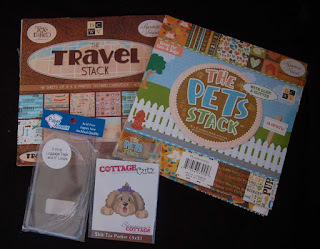 Hope you were pleased to read this blog post. Leave me a comment if you desire and to make me super happy! 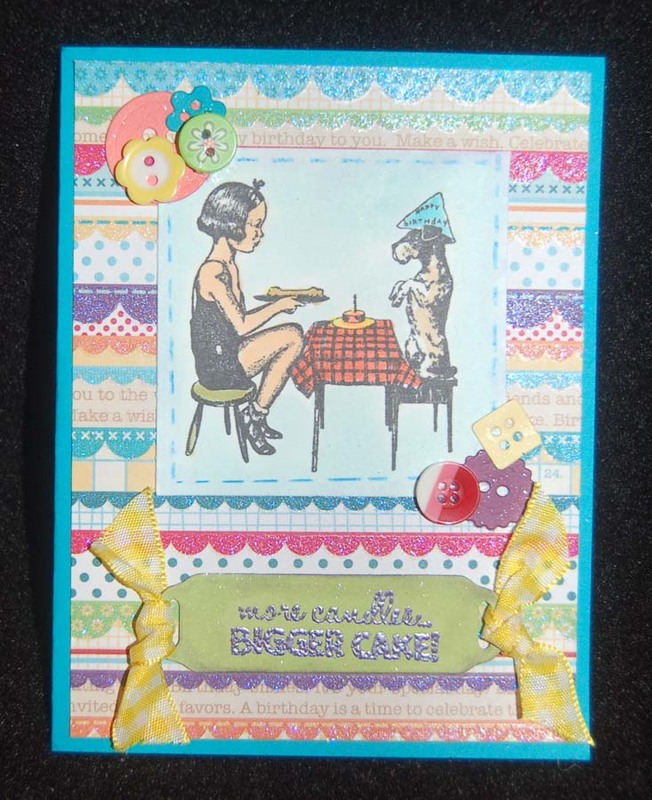 Here is version #2 of a card made with the same technique described in my previous blog post. The background in this one has the same embossed hearts, but they are not white due to paint running into the indents in the folder. At first I was going to toss it, but then I liked the way the colors ran on the watercolor paper. The fold on the card of the Studio G card bothered me a bit because it wasn't scalloped so I added a ribbon and a Dress It Up mini heart button. For this card I used the Lawn Fawn die cut word, 'hugs' on the front and stamped the Hero Arts words, ' You are my favorite' inside. I think I will send this card to my sister (perhaps as her birthday card...one week before Valentine's Day) because it is always our joke that we are each other's favorite sister....there are only two of us....LOL!